The Center for Union Facts is a 501(c)(3) nonprofit organization that fights for transparency and accountability in America’s labor movement. For too long, big unions have opposed employee rights, engaged in self-dealing and corruption, and made excessive demands that have killed tens of thousands of jobs and driven major cities into bankruptcy. With a record like that, it’s no surprise that union membership in the private sector has collapsed and unions’ favorability has plunged. But even as they lose members and public support, labor unions fight at every opportunity against giving their members the resources to hold leadership accountable and try to hide the truth about their multi-million-dollar political campaign operations with front groups. We have compiled a searchable database of public information on America’s labor unions, including data on officers’ salaries, membership trends, corruption charges, and key financial data. We provide resources to workers curious about their rights when a union comes to organize their workplace or about how to get rid of a union that no longer serves their needs. We additionally keep a watchful eye on union activities, especially their political activities and efforts to suppress employee rights. No. We are against union officials’ abuse of power at the expense of their own rank-and-file members. We are against corruption, violence, and intimidation. We are against the misuse of union dues. We support employees who elect to join a union, as well as the right of employees to remain or become non-union without intimidation. So who are you guys, really? The Center for Union Facts is a 501(c)(3) non-profit organization supported by foundations, businesses, union members, and the general public. We are dedicated to showing Americans the truth about today’s union leadership. Is this part of a political effort? No. The Center for Union Facts does not support or oppose candidates for office. 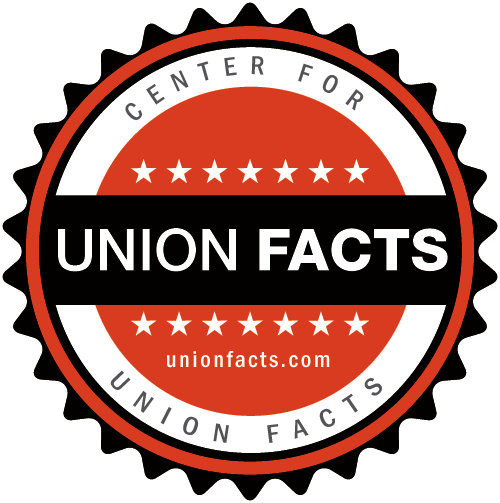 How can I support the Center for Union Facts’ mission? The Center for Union Facts is currently educating the public on a series of proposed reforms to federal regulation of labor unions—the Employee Rights Act. You can find out more (and contact your legislators) about the proposed reforms at EmployeeRightsAct.com. And as a 501(c)(3) nonprofit, we can always use your tax-deductible donations. I’m having trouble with my union. What do I do? Visit our resource page for union members. Click here to learn more about your rights. The information, including personal salary and compensation information, published by this website is public record under the Labor Management Reporting and Disclosure Act of 1959 (as amended). Unions are obligated to report this information to the Department of Labor Office of Labor-Management Standards, which publishes it at UnionReports.gov and for download in a database. We re-publish the content of the government databases as downloaded periodically. For legal reasons, we cannot amend, withdraw, or change in any way the information that we receive from the Department of Labor and re-publish to our database of union facts. If you believe that the information is in error, you must take it up with the Department of Labor and/or the labor union that filed the relevant report. Note that the salary and compensation data reported by the union may not reflect total annual earnings. Please input the text below.